The contemporary vocabulary of transgression—genocide, crimes against humanity, and war crimes—crystallized immediately after the Second World War. The stimulus for this celebrated conceptual development is commonly thought to be the Holocaust. By analyzing the vocabulary of transgression in the long nineteenth century, Dirk Moses will argue that the postwar codifications destroyed the creative pluralism evident in the European concern for the fate of Armenian and other Ottoman Christians. Far from enriching of the modern imagination, today’s categories even blind us to the origins of violence against civilians. What would be the consequences of returning to the previous vocabulary? 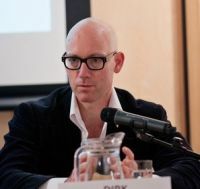 Dirk Moses is Professor of Global and Colonial History at the European University Institute in Florence and senior editor of the Journal of Genocide Research. He is the author of German Intellectuals and the Nazi Past (2007) and editor of many books including Empire, Colony, Genocide: Conquest, Occupation, and Subaltern Resistance in World History ( 2008), and co-editor of the Oxford Handbook on Genocide Studies (2010, with Donald Bloxham) and of Colonial Counterinsurgency and Mass Violence The Dutch Empire in Indonesia (2014, with Bart Luttikhuis).